You can get by just fine being dull. You can actually do very well for yourself. My husband was an accountant in suburban Oklahoma at an office above an Applebee’s. He made six figures and drank from a coffee mug with Mount Rushmore engraved on it. He did this every day for 20-some years. Then on a snowy Tuesday, standing at the microwave in his windswept khakis, watching his leftover casserole go round-and-round, he lost his edge. Out the window, kids skated on a makeshift ice rink in the strip mall parking lot. The casserole boiled over then exploded as he walked out of the building, leaving the dead hum of fluorescents behind. I was in the kitchen chopping onions for goulash when he walked in and took the knife out of my hand. 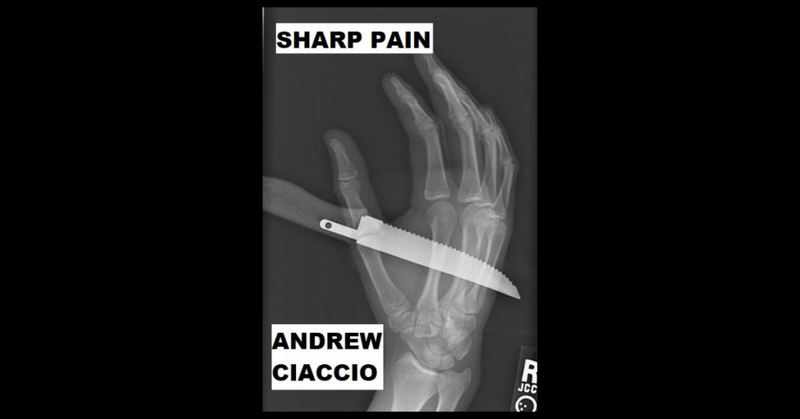 He threw it in a 50-gallon black trash bag where it clanked against the other serrated knives already at the bottom. He moved down the granite counter, throwing in a butcher knife and paring knife. “Anything sharp has to go,” he said tossing in a peeler. I sat down at the table with tears in my eyes. “Damn onions!” he shouted back, disappearing into the garage with the bag slung over his shoulder. He emptied the fishing hooks from his tackle box. He tossed in drill bits, needle nose pliers and a putty knife from his workbench. He dismantled the lawn mower and bagged the blades. Then up the stairs to my office. He riffled through my desk, took out a pair of scissors and emptied the stapler. He examined two pencils, threw the sharpest one in. He moved through dressers and drawers, shelves and crawl spaces. When he came to the last closet at the end of the hallway, he stopped. I watched the blood drain from his face like he’d been cut lengthwise. Out of a plastic bin, he brought up a pair of little pink ice skates. He took off his glasses and rubbed his eyes. The blades went out of focus as the sharp realization of what was really lost came clear.